TATA CORPORATION TAIWAN BRANCH was established in 1983 for exporting all kinds of yarns, textile raw material, Chips, POY, polyester, viscose & polypropylene stable fibers for spinning & non-woven used, sewing machine, sewing & knitting needles & spare parts, FDY & POY machine, hole plant & spare parts, DTY spare parts ... etc. 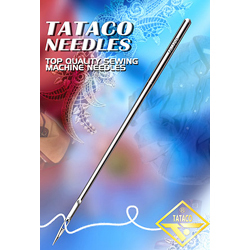 and cooperated with the largest leading industrial machinery needle manufacturer in Taiwan "Triumph Needle Corp." to produce TATACO needle, which has specialized in the design and manufacturer of industrial circular knitting needles through the acquisition of high-tech facilities and know how from the German company "Lammertaz", which was the renowned and remarkable company in making sewing needles of the world. Over 24 years, we have developed a team of specialists & accumulated vast experienced to produce a wide range of sewing needles, we ever sold back to Germany under their brand. Aimed to be an ISO-f9002 certified manufacturer, we adopted the same to meet a strict quality control process as the same system for meeting the requirements of the most demanding customers and bring our customers high profits. 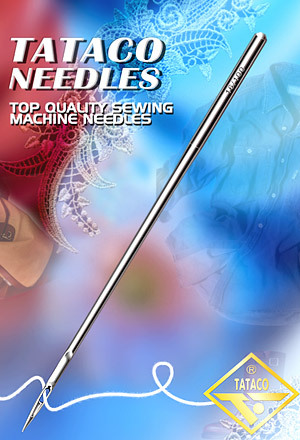 Most recently, the "Diamond coating" system is developed by its unique needle production process and combined with the most advanced needle technology, its special treatment of coating makes it become more durable low friction than the one coated with Chrome, up to four times life than conventional coating, the wear-resistant needle is ideal for many applications and tougher enough to survive the most abrasive condition trust in that the tougher we make it, the better you'll like it! Backed with over three decades of manufacturing experience and our over 200 staff members ensuring high quality, rapid production time, low cost and testing facilities, our product quality as well as working efficiency and creditability have convinced our customers that we are one of the leading manufacturer in the field. in order to further satisfy our customers with outstanding business service, we will continue to research and develop more advanced systems of needles to meet the stringent market demands. Thank you for taking the time to visit our site. If of-Service to CAN BE We you, Feel as Free Business Card to US. Our the Sales Department, and Regional Distributors Authorized Agents are able and Willing to Assist you to correct items View SELECT for the with the any or your Production Applications Product Question May you have have.